After making the mistake of boiling and processing jelly on the hottest day of the year so far, there was no way I was going to get involved in anything else like that for dinner. Not even pasta. 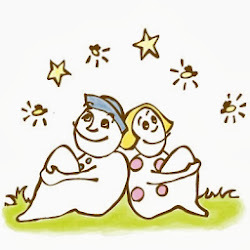 And considering all Starboy wants to eat these days is cheese, bread, O's and yogurt, you have to get creative around here. 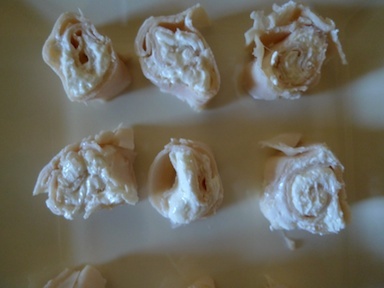 Slices of turkey rolled with cream cheese and sliced. 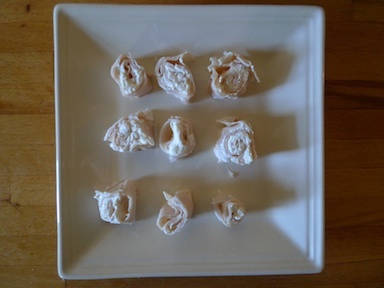 Presented as "party food." This likely would be prettier if it weren't 89 degrees in the kitchen. But A/C is expensive and the hot season is just beginning, so we're sucking it up a little here. That wasn't enough for dinner though, so O's were requested. Then yogurt. 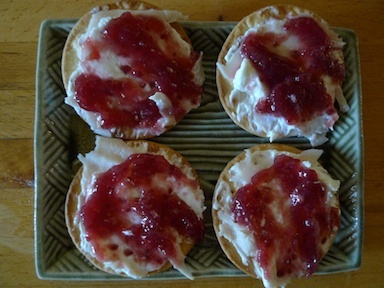 Then a jam sandwich. "But no. turkey." 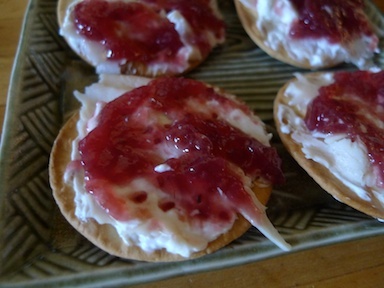 Enter the Hidden Turkey Cracker appetizer: Water crackers, whipped cream cheese, a thin slice of turkey, more cream cheese, jam. He complained, but he ate it all, and some grapes. And a juice ice pop. Man, is it hot today.